Home / Guides / Set Up Your Own Ecommerce Site For Free! Set Up Your Own Ecommerce Site For Free! Opensource softwares have revolutionised the internet and has made it possible for people with no web design or development experience to set up their own professional website. Whereas WordPress has become the number one choice for powering blogs and content managed websites. Opencart has stollen the march to become the top opensource ecommerce platform. In this post I am going to give you a brief outline on how to set up an ecommerce site for free. Now, when I say free, the actual building and set up of the website will be free, whereas if you went to your local web design company it would cost £1000s. Although there will be costs involved for setting up your domain and hosting, that is unavoidable if you want a website, I will point you in an affordable direction. Right, hopefully you now have a domain and hosting set up and we are ready to move on, but before we do click here if you wish to find out more about Opencart. If you have followed our advice and gone with a host that provides you with an Opencart one click install this next step could not be easier. Once your hosting and domain is set up, go to your hosting control panel and navigate to the bottom where there will be a list of one click intalls. 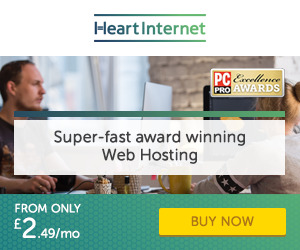 With Heart Internet hosting the Opencart one click install will be found in the ecommerce section, but this may vary for other hosts. Once you have located it click on the Opencart logo. Once the script has installed successfully, navigate to your domain name and follow the process of setting up your Opencart ecommerce store. The process is very well laid out and easy to do…… And you are done! It really is that easy. The defult installation of Opencart will provide your with a fully functional ecommerce shopping cart and catalogue system, the default theme, and a backend admin area where your can control the shop. Now, although it is perfectly acceptable to use the default theme and many do, I strongly suggest that you use a custom theme to give your site that polished look, which will of course improve your rates of sales in the long run. In the next section we will look at where you can find amazing looking themes from £20 to £30. Themes are essentially skins for your website, which will change the way the front end of your website looks. Instead of having a theme designed and built for £100s, there are many online stores and market places that provide a wealth of amazing themes to purchase for as little as £20. As I have said above, there are many places where you can acquire Opencart themes but ThemeForest is top of the pile for my choice, quality and value. Click here to view ThemeForest’s range of Opencart themes. Once you have selected and purchased a theme that matches your branding and the look you want, you are ready to install. I really hope you have found this article beneficial and if you do follow our guide through and set up your own ecommerce website, please get in touch. We would love to see your end result plus we may even feature it in a later post, which will of course give you great exposure. Thank you for taking your time to read this article and as always if you like what you have read feel free to give us a share on your favorite social network.